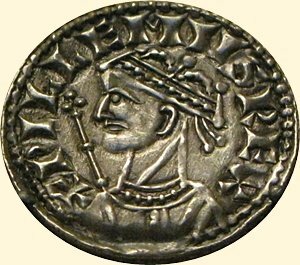 William of Normandy, the big, burly, strong, stern, iron-willed man who revolutionized old England's Anglo-Saxons. A wise, far-seeing, tough individual in a rough and rude time, William was as strict with self as with others and owed his place in history to his own qualities. 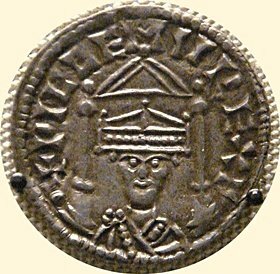 All three of the following coins are from the time of William the Conqueror's reign, and are in the British Museum. 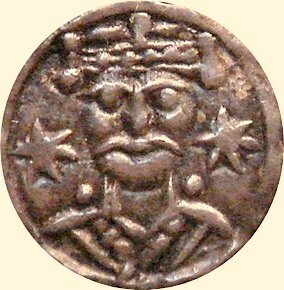 William the Conqueror, silver coin from the 1000s "
The new monarch's task was to subjugate London and one of the first decisions he made following his victory at Hastings in 1066 was to construct castles throughout England to ensure his control over the new kingdom. In the years after 1066 the towns of Saxon England were subjected to a whirlwind programme of castle-building as William the Conqueror sought to impose his will on the locals by creating a network of fortified power-bases. 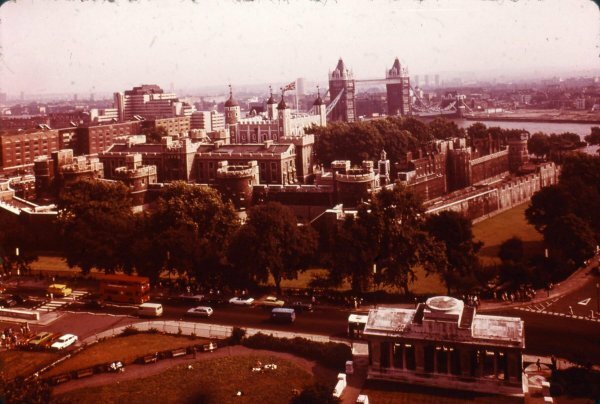 One of these fortifications later developed into the site known as the Tower of London. 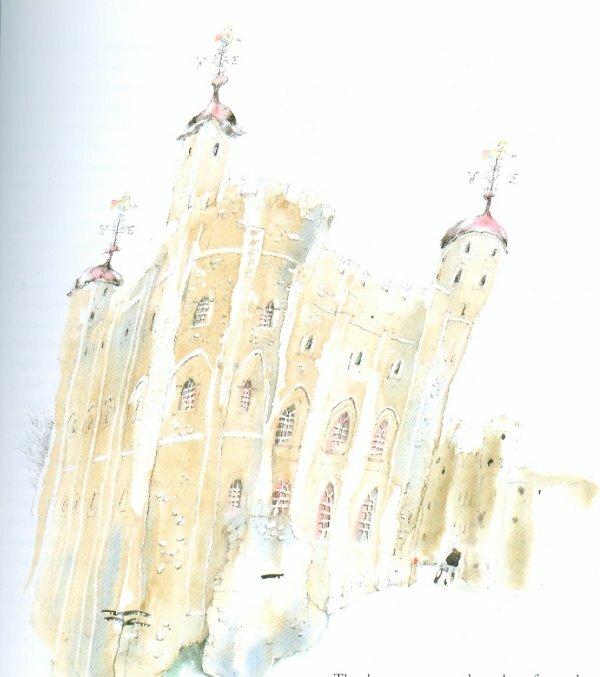 Its great central keep or White Tower was erectred by the monk Gundulph, Bishop of Rochester in 1078 for William the Conqueror. The Norman donjon loomed over the eleventh-century cityscape. This highly visible symbol of foreign rule rose some ninety feet in the air, its massiveness meant to emphasize its dominance. Standing on the north bank of the River Thames below London Bridge, it was built with its most impressive side facing in rather than out, making it an unmistakable feature to river traffic entering the capital from continental Europe. 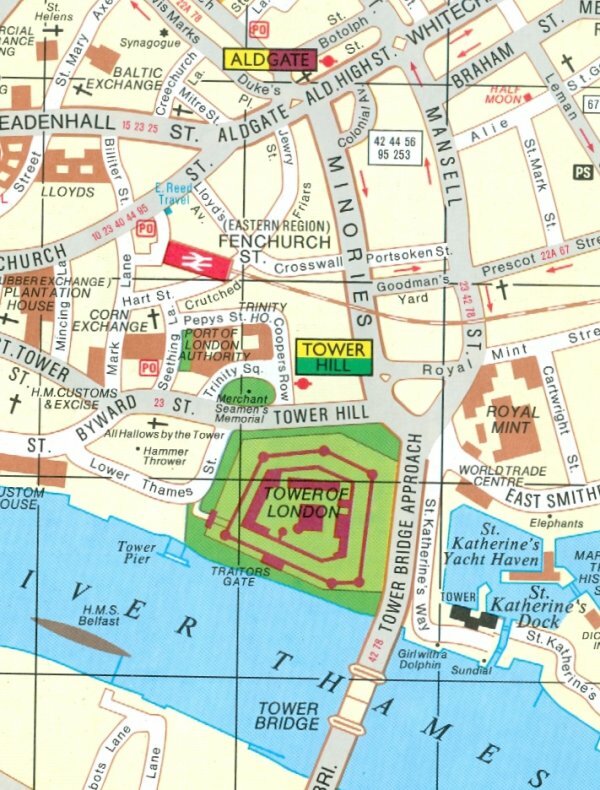 The most important of William's castles, it overawed the city and guarded the Thames. The magnificent architecture of the White Tower, whitewashed during the Middle Ages, covers almost all the styles which have flourished in England. It served early in its history, not as a prison, but as a royal residence, grand and glorious. At its centre is the turreted Norman White Tower, William's three storey central keep. 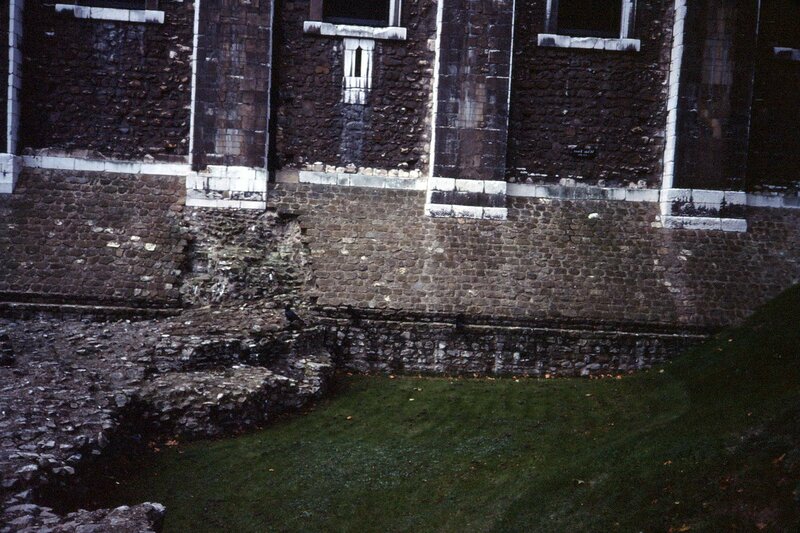 It is surrounded by an inner curtain wall, largely built at the time of Henry III and an outer wall by Edward I. 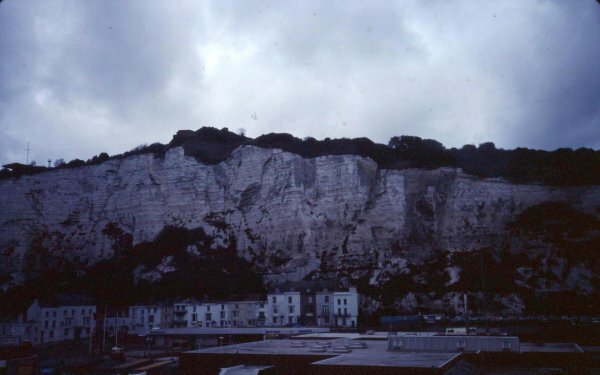 Its massive ragstone walls - 30 metres (90 feet) high and up to 3.5 metres (12 feet) thick at the base - were constructed of Caen stone from Normandy. Virtually completed by Edward I, who died in 1307, it is a perfcct example of early medieval military archiectture. 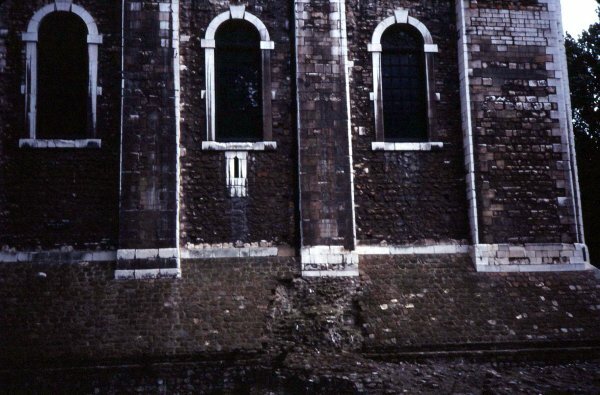 The ogee caps (pointed arch) on the White Tower's turrets were added in the late 14th century. 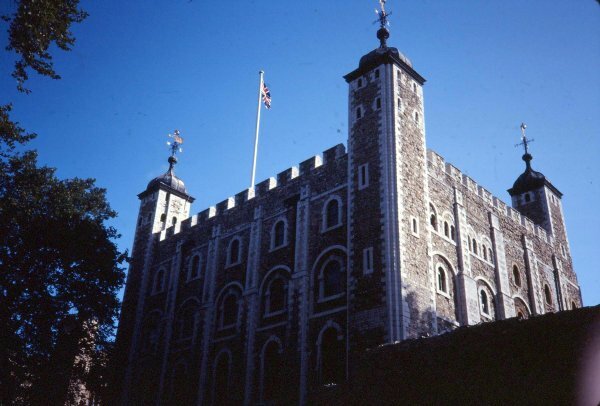 Notable features include: the Bloody Tower, with its portcullis, where Sir Walter Raleigh began to write his History of the World; Traitors' Gate through which State prisoners passed; the Jewel House with the Crown Jewels; Tower Green, site of the execution block; the Tower Ravens; the Royal Chapel; the Beefeaters in traditional uniforms. A castle, a palace, a symbol of the sovereign's might. 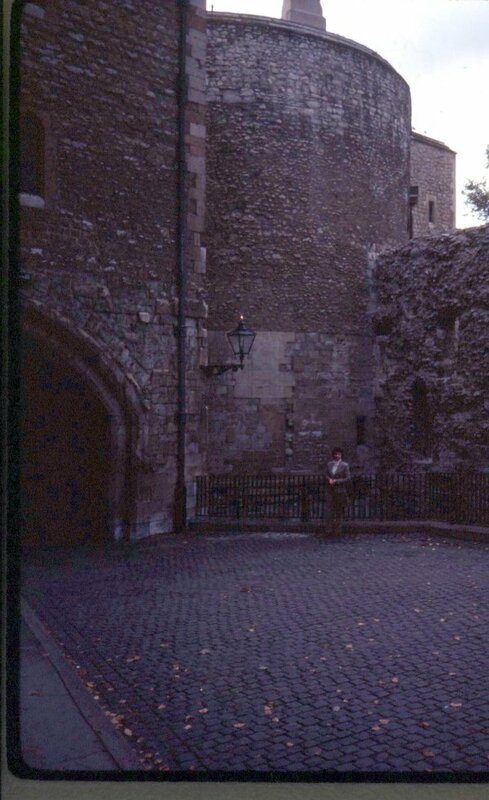 Traitors' Gate under St. Thomas's Tower gave access to the fortress from the River Thames. Here on their way to the scaffold, passed such figures as Anne Boleyn, Catherine Howard and Princess Elizabeth, one of the few to survive the drive and become Queen, who then dispatched more than her fair share to suffer a sadder fate. An old tradition says that the mortor used in this building was mixed with blood. Given its grisly history torture and bloody executions, it seems to make sense. The Tower of London is synonymous with terror, cruelty and death by burning or beheading. For others the filth and disease of the rat-ridden Tower brought death as surely as the headsman's sword. Twenty-one towers comprise the Tower of London castle complex. They were built to accommodate kings and others whose stay was often cut short. 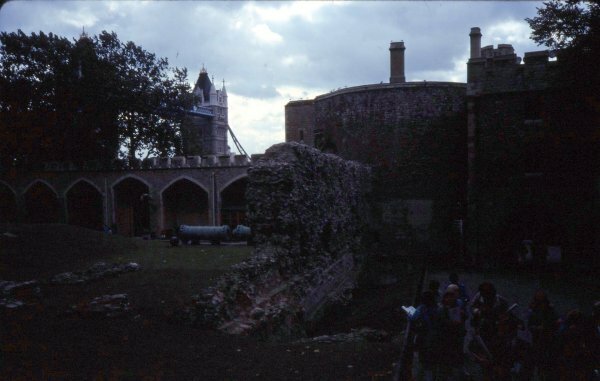 The towers also serve as gateways protecting the Tower of London's concentric castle complex. 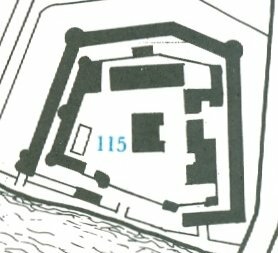 The castle's concentric design ensured protection of the Tower of London with successive lines of fortification. Many of the different towers were gradually added over hundreds of years to provide additional protection. The upper floors of the White Tower now house the Norman Chapel. This serenely quiet place was said to have given strength to Lady Jane Grey as she prayed here the night before she died. She was called The Nine Days' Queen having occupied the English throne from 10th to the 19th of July, 1553. In 1503 Elizabeth of York, wife of Henry VII, died in childbirth and lay in state in this chapel for three days, her corpse enclosed by 800 candles. Wakefield Tower housed Henry III's sumptuously decorated private chamber. Richard III reportedly sent one of his court nobles, Sir Henry Wyat, to the Tower to starve to death for political crimes. Sir Henry's pet cat followed him to the Tower and crept down the chimney every day with a freshly killed pigeon. Wyat remained alive for months and when Richard heard of this occurrence, ordered him released. 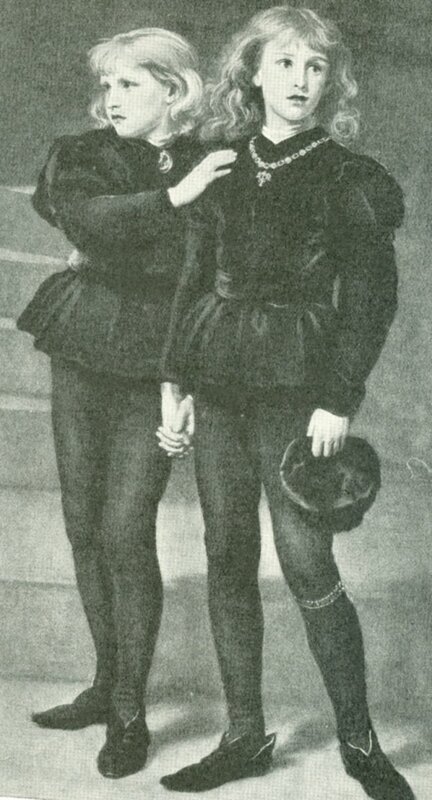 Edward V and his brother Richard, Duke of York, Edward IV's young sons, were silenced forever, smothered with their own pillows. Two skeletons of boys were found in a stairwell leading to the Chapel of the White Tower) on the 17th day of July 1674. It was thought they had been killed on the orders of their uncle, Richard III. It is believed by some that Richard is falsely defamed for being charged with such a heinous happening. 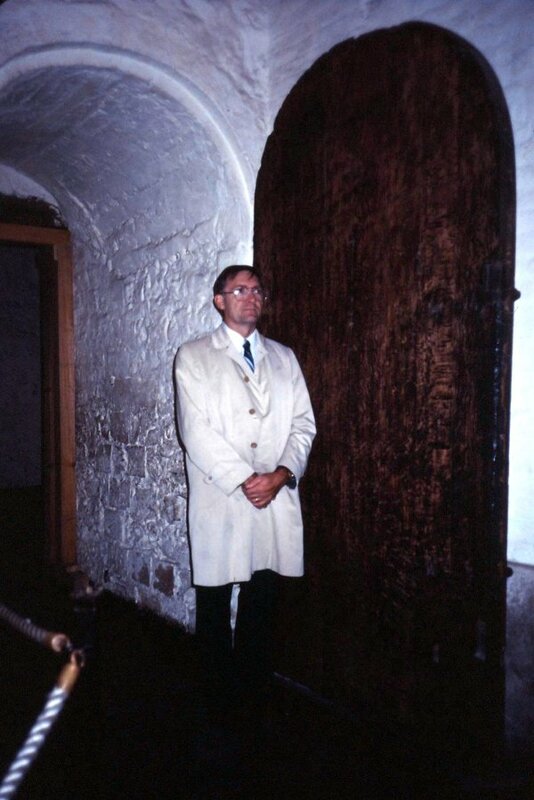 Clergy were frequently taken to task in the Tower by the sovereign they served. At Henry's caprice, he sent wise and worthy servants to the Tower, their number including Archbishop Cranmer and Bishops Ridley and Latimer, each charged with heresy for which they were condemned to death by burning at the stake at Oxford in 1556. "You are to guard them securely in the prison of our said Tower in such a way that you shall answer for them body for body. Fail in no part of this on pain of forfeiture of life and limb and all property you hold in our realms." The Constable bids a favourite a Final Farewell. The Bell Tower was built in the 13th century and is so called because of the belfry on top. In the past when the bell was rung in alarm, drawbridges were raised, portcullises were dropped and gates shut. The bell is still rung in the evening to warn visitors on the wharf it is time to leave. The future Queen Elizabeth I was kept here during much of the reign of her sister, Mary. The ravens that hop about soaking up the sun have an important part to play in the history of the Tower. These black birds are so important to the people of England, that they are kept at the Tower of London at the expense of the British government. Legend has it that should they fail to fly about these premises, the great White Tower will crumble and a terrible disaster shall befall England. Even Winston was worried about the fate that might befall if they failed to find a home at the Tower, so he ordered that food always be fed to the few who flew there just in case. One last look at a shady nook. 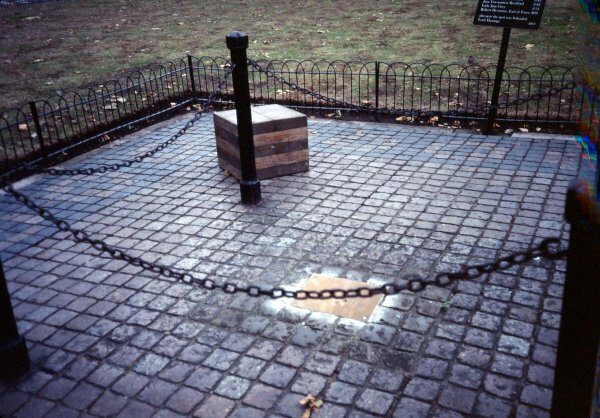 Between the Chapel and Tower Green is a small paved area where scaffolds were regularly erected, so that heads would roll of rascals whose more public execution on Tower Hill, might have incited supporters to riot. The names of dainties who died on this fateful spot are inscribed on the board. 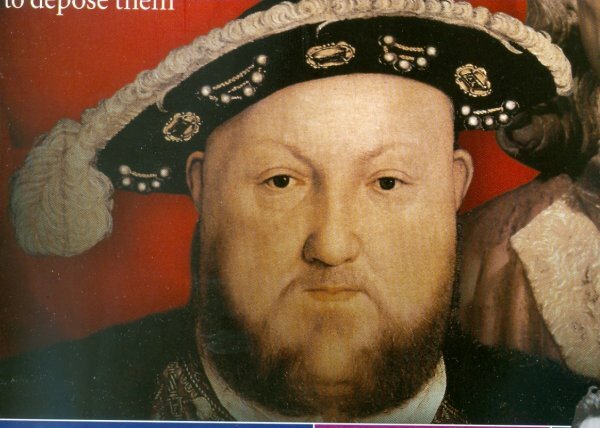 Henry VIII - the villain who vanquished his mates by severing connection with them. Henry's lecherous loves quickly cooled and two of the wives, who shared his bed, were shortly led to the block. The ill-fated cast-off queens - Anne Boleyn and Kathryn Howard. Anne Boleyn by unknown artist. She is wearing the French hood, which she introduced into fashion after 1525. Another monarch managed to rid herself of suitors in the same way. Queen Elizabeth dumped one dandy, Robert Devereux, Earl of Essex, lost his head over her here. 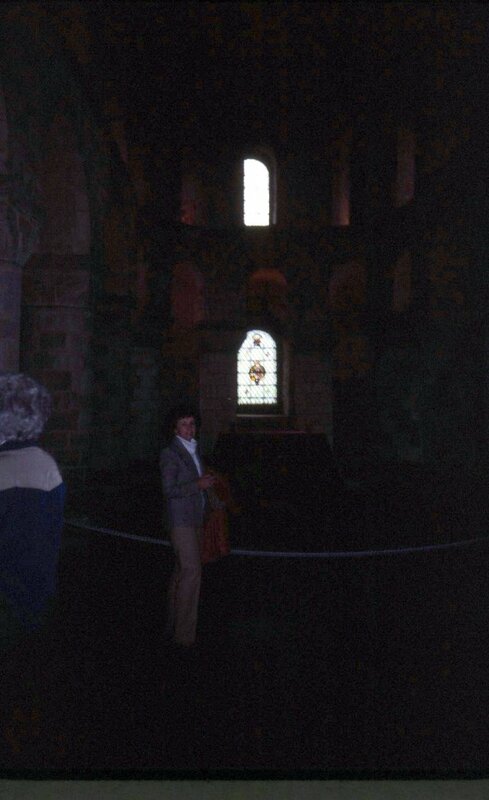 A special spot where the favoured few lost their heads in relative privacy. Henry wished to marry Anne Boleyn because he believed she was capable of bearing a son to succeed him. When she failed to fulfil this function, but delivered a daughter instead, her satiated-sovereign consigned her to the Tower. Anne was taken by barge in full daylight, her queenship not quite sufficient to grant her the graciousness of a nightime trip to that place of sadness and sorrow. Nor did she lose her life in the privacy of the place. So great was the fascination with her fall, two thousand happy, as well horrified onlookers, flocked to see the French swordsman from Omers, an expert at severing with the sword, cleanly cut off her head with one stroke on the 19th of May 1536. The Chapel Royal of St. Peter ad Vincula ("St. Peter in chains") is the parish church of the Tower of London. It is situated within the Tower's Inner Ward and dates from 1520. The name refers to St. Peter's imprisonment under Herod Agrippa in Jerusalem. 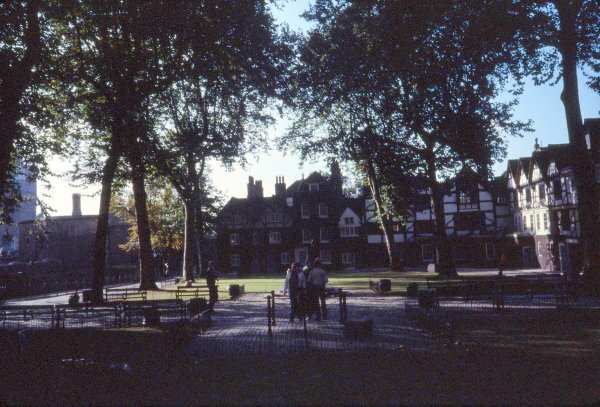 The historic Chapel Royal of St. Peter ad Vincula is the oldest chapel royal in England. The Chapel is probably best known as the burial place of some of the most famous prisoners executed at the Tower. In this little chapel, most of those who died on Tower Hill and six of the seven executed on Tower Green found their final rest under its flagstones without fuss or frills of any sort. Such was the ceremony served Henry's once fiercely-fancied Anne, whose separated sections were wrapped in white cloth and buried beneath the flagstones in an unmarked grave. Henry, hovering within earshot, heard the boom that beckoned Anne to eternity and forthwith flew to join Jane Seymour waiting in the wings to welcome him. The Tower has a well-deserved reputation as a place of deep dungeons and murderous mayhem. Grim tales are told of the tragic events that occurred in this fearsome place, the haunt in which hovered the ghosts of those gone. 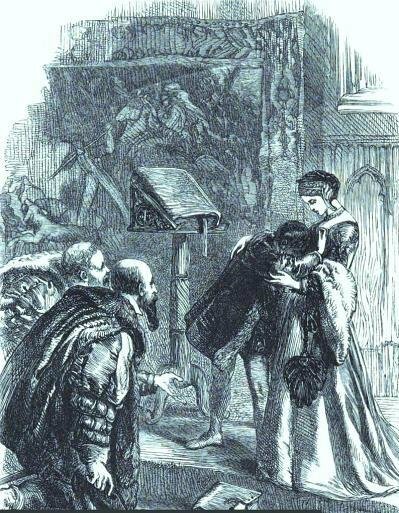 One familiar phantom that frequented that daunting den was Anne Boleyn, whose frail, white figure floated and freaked out a guard, who promptly fainted and was fired. Anne shared this spirit world with other famous gliding ghosts, including Henry VI, Lady Jane Grey and the two tiny tot spirits of the little Princes. On the 27th of May, 1541, another tenant of the Tower, seventy year old Margaret Pole, Countess of Salisbury, was awakened and told she was to die within the hour. Margarets's rank saved her from being burned alive, the statutory penalty for female traitors. Instead she was taken from her cell to the place within the precincts of the Tower of London, where a low wooden block had been prepared. All the while, Margaret was protesting that no crime had been imputed to her. Some 150 witnesses waited to watch the sorry proceedings, for she was executed with appalling barbarity. According to some accounts, Lady Salisbury, old, frail and ill, was dragged to the block. 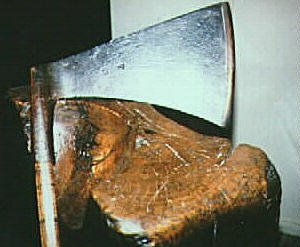 Refusing to lay her head upon it, she was forced down and in the struggle, the inexperienced executioner's first blow gashed her shoulder. Ten additional blows were required to complete the execution, "Her head and shoulders were hacked to pieces". Another version of bizarre beheading stated that she lept up from the block after the first clumsy blow and ran wildly about the room, pursued all the while by the executioner, hacking at her as she ran. Onlookers related that he struck her eleven times in various parts of the body before she succumed to the savagery. 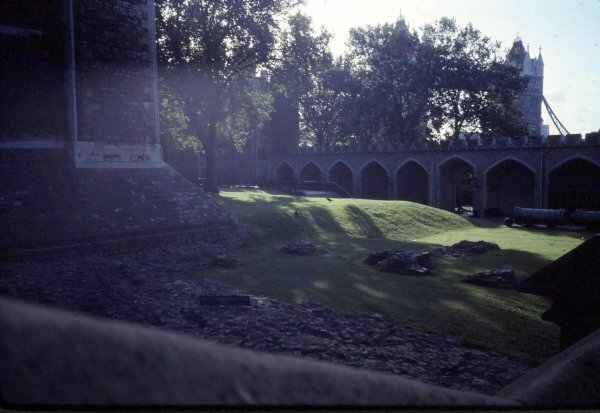 Margaret's mangled body was buried at the Chapel of St Peter ad Vincula within the Tower of London. The following was scratched on the wall of her cell. Margaret's crime: she was one of the last of the White Rose faction, symbol of the House of York, that vied with the red-rosed House of Lancaster for the crown. Henry VIII wore it and was not taking any chances of losing it as a result of the real and imagined White Rose conspiracies that haunted the Tudors for decades. 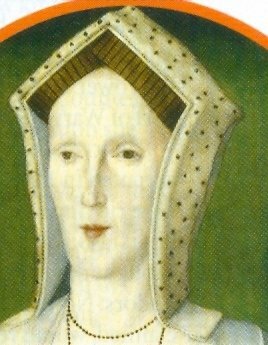 Henry was freed of his fifth worrisome wife, Kathryn Howard, who was also beheaded here, Kate's special status as one of his "queens-for-a-day", earned her the right to be severed in relative silence, free of glare of nosy nonentites, whose eyes were regularly riveted on this method with which their monarch managed his marital mis-matches. Even Queen Elizabeth's noted naval hero, Sir Walter Raleigh, shared their fate as a phantom. A hostage whose home was the horrid haven, Raleigh reconciled himself to his thirteen years in the Tower. He used the tedious time to write a book, History of the World. He also conducted numerous experiments, regularly seen hovering over a boiling beaker wreathed in clouds of smoke, as he puffed his pipe of Virginia tobacco. Destined to die upon the block, Walter awaited the fateful call, passing part of each day strolling on what became known as Walter's Walk. 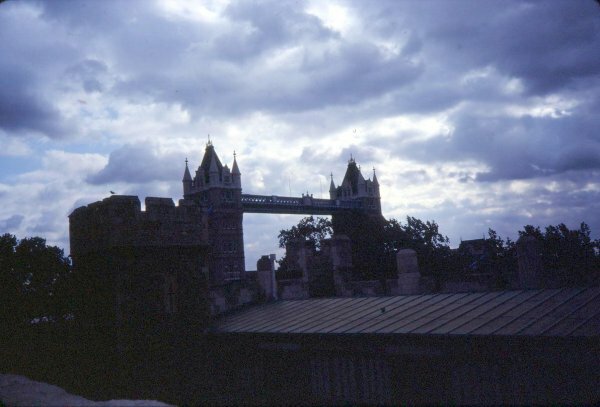 From here he viewed life on London Bridge, watching walkers passing along unfazed by the fate that awaited him. Raleigh's view of Tower Bridge as seen from "Walter's walk." Asked to see the sword that would be used, he said, "This is a sharp Medicine, but it is a Physician for all diseases and miseries." In the state of hysteria induced by the anti-Catholic mania, no less a personage than Pepys was sent to the Tower on 22 May, 1679. 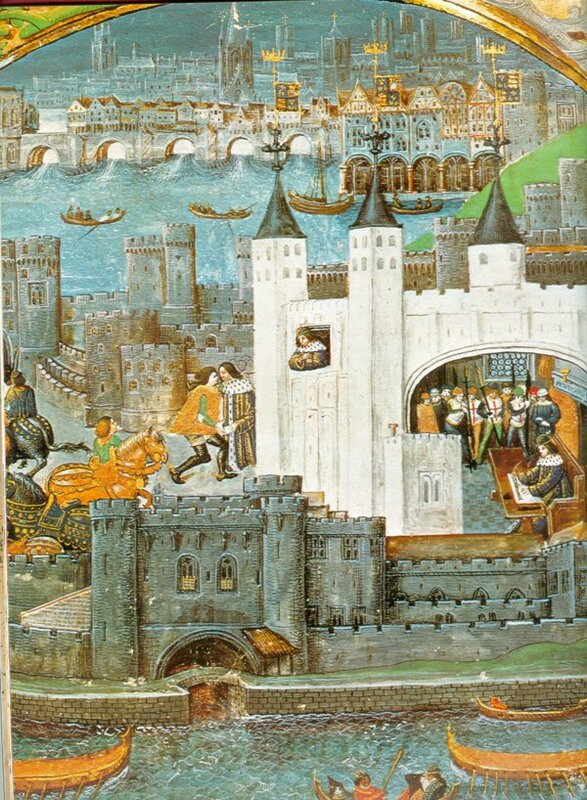 Attacked by political enemies, Samuel resigned as Secretary to the Admiralty and was subsequently imprisoned in the Tower of London on suspicion of treasonably leaking naval intelligence to France. Accused also of being a papist, Pepys was released in July. Many were imprisoned in the Tower, their last hopes fading as they entered through the Traitors' Gate. That name has been used since the early seventeenth century. Prisoners were brought by barge along the Thames River, passing under London Bridge where the heads of recently executed prisoners were often displayed on pikes. 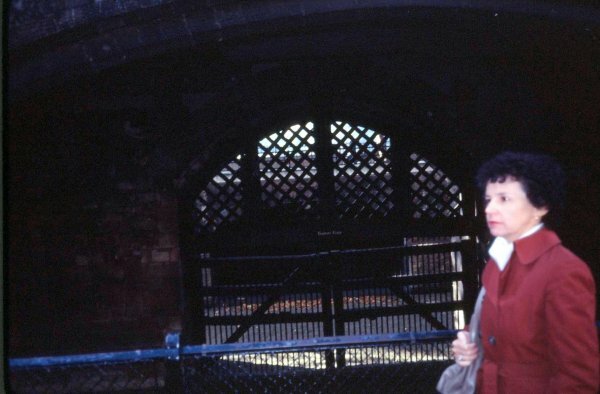 Queen Anne Boleyn, Sir Thomas More and Queen Kathryn Howard, all entered the Tower by Traitors' Gate. The dark, dank, dreary, cold, grey walls of the prison bear a great deal of graffiti, scratched there by unfortunate folk awaiting the block and the blade. One is particularly poignant. One word, 'Jane', is the heart-rending reminder left by Lord Guildford Dudley before he was taken to be beheaded for plotting the overthrow of Mary I (Bloody Mary).. Walls weathered by words of the woebegone. 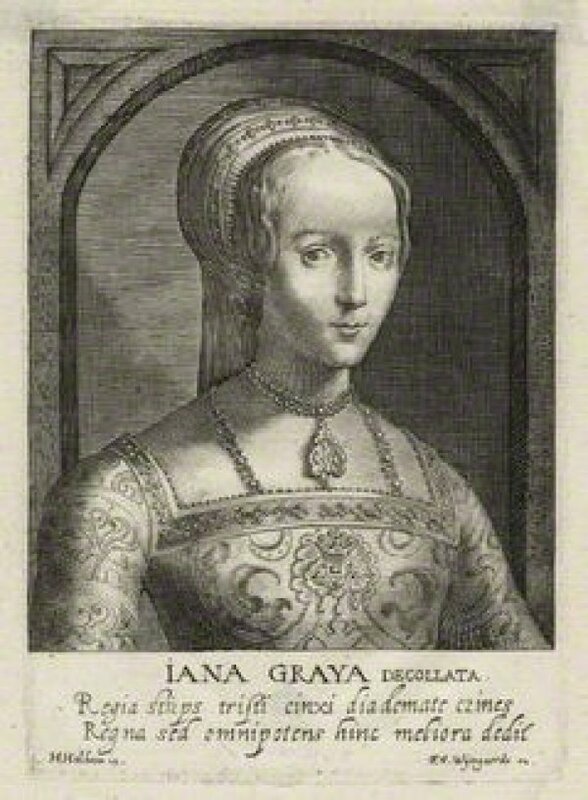 Lord Guildford Dudley's wife, Lady Jane Grey, was not involved, but was beheaded by association and thought by Mary to be too dangerous a rival. Jane's execution was conducted in private on the orders of Queen Mary, as a gesture of respect for her cousin. The executioner asked her forgiveness, and she gave it. 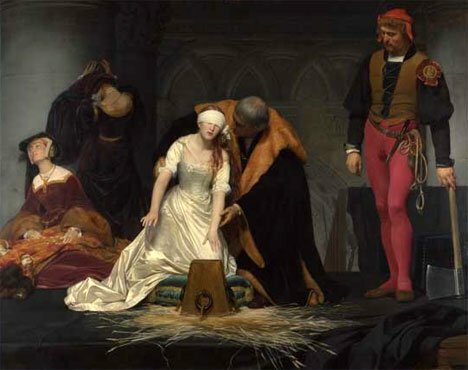 Then with the words, "Lord, into thy hands I commend my spirit, " she was beheaded. .
Lady Jane Grey prepares for her execution. Lady Jane Dudley (nee Grey)in happier times.. The Tower of London armoury contains one of the best collections of armour and weapons in the world. The great arsenal supplied medieval kings and their armies. 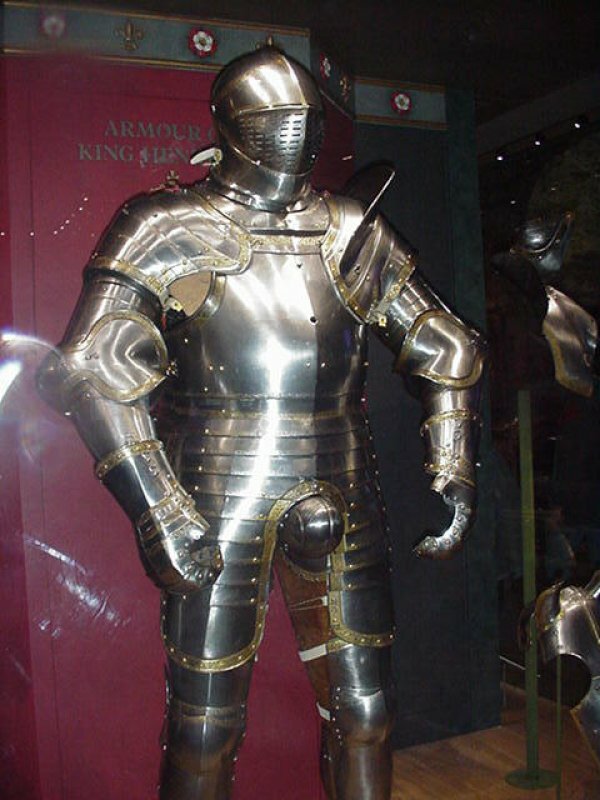 Several suits of armour belonged to Henry VIII. As late as 1540 when he was forty-nine, Henry ordered the finest suit of armour craftsmen could create. 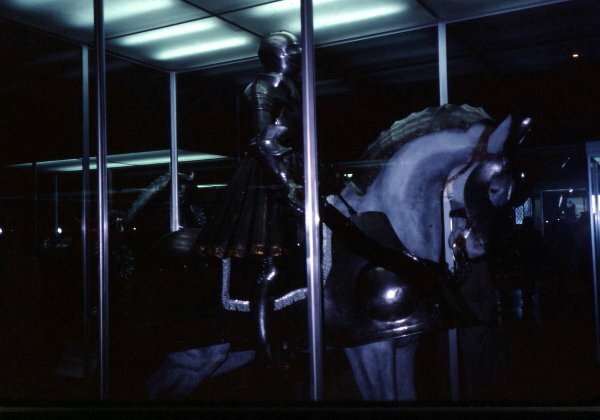 Measuring this suit of armour showed that his waist had ballooned from a medium thirty-four inches to a bloated and gross fifty-two inches.The massive suit of armour was delicately etched and gilded by Holbein, but the most eye-catching feature is Henry's majestic, shiny steel codpiece. Once word reached Charles in the Low Countries that the monarchy was restored in England, he boarded the Naseby, renamed the Royal Charles and accompanied by a fleet of twenty ships, quickly departed for Dover. Happy as well as horrid scenes took place at the Tower. Where there's a king, there's a crown. 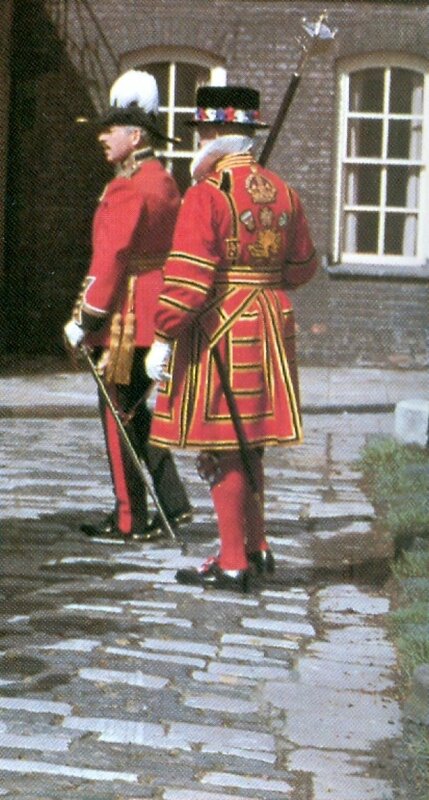 Cheering throngs were diverted by the colourful spectacle of Charles II riding from the Tower of London in a lavishly costumed cavalcade to Whitehall in preparation for his coronation. 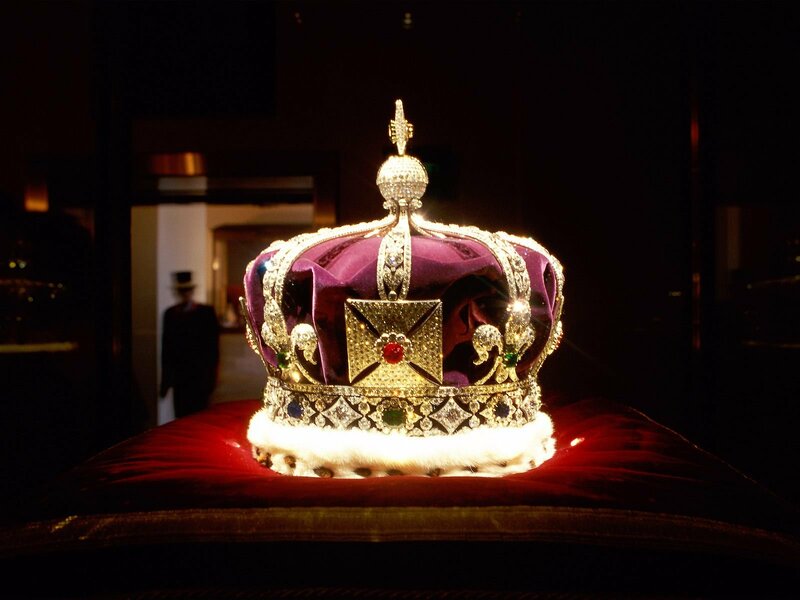 Named for St.Edward the Confessor, St. Edward's Crown was first worn by Charles at his coronation. in 1661. 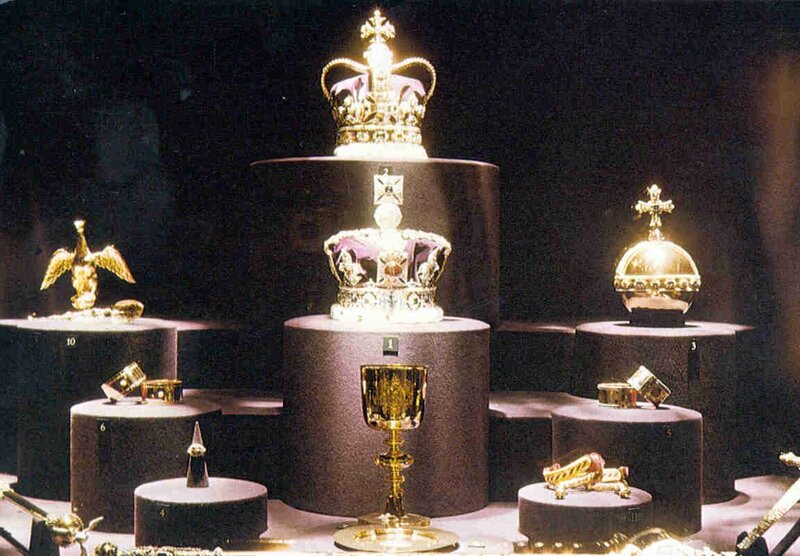 It along with the fabulous Crown Jewels are kept under lock and key at the Tower. 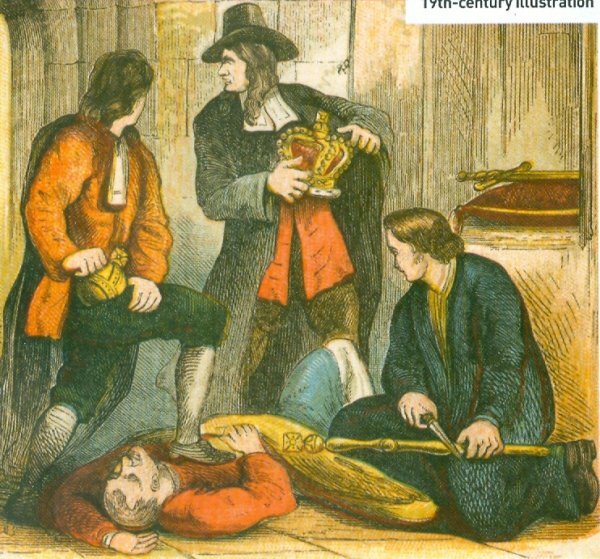 Despite tight security and the wary, watchful eye of the Master of the Jewel House, a daring attempt was made in 1671 to steal the crown jewels. The villain, Colonel Thomas Blood, an Irish adventurer well known for his various conspiracies following the Restoration. While Blood flattened the Crown so he could hide it under his flowing robes, one accomplice sawed the royal sceptre in two, while another stuffed the orb down his trousers. Spitting the gag from his mouth, the Master shouted, "Treason, Murder, The crown is stolen." Dropping their loot the robbers sought to flee, but were apprehended by the palace guards. Undaunted by his failure to succeed with so daring a deed, the boastful Flood bellowed, "It was for a crown." Brought before Charles, Flood confessed he had once considered assassinating Charles as the sovereign swam in the Thames, but he said,"his heart misgave him out of awe of his Majesty." Amazingly, instead of having him executed on the spot, the Merry Monarch took a liking to the man and pardoned him. Blood became a secret agent for the king. 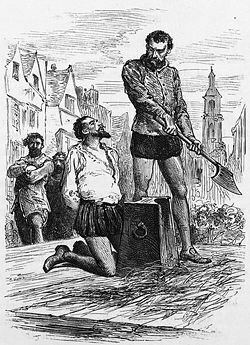 The last person taken from the Tower for execution was the eighty-year old Lord Lovat, beheaded in 1747 for his part in the Jacobite rebellion. 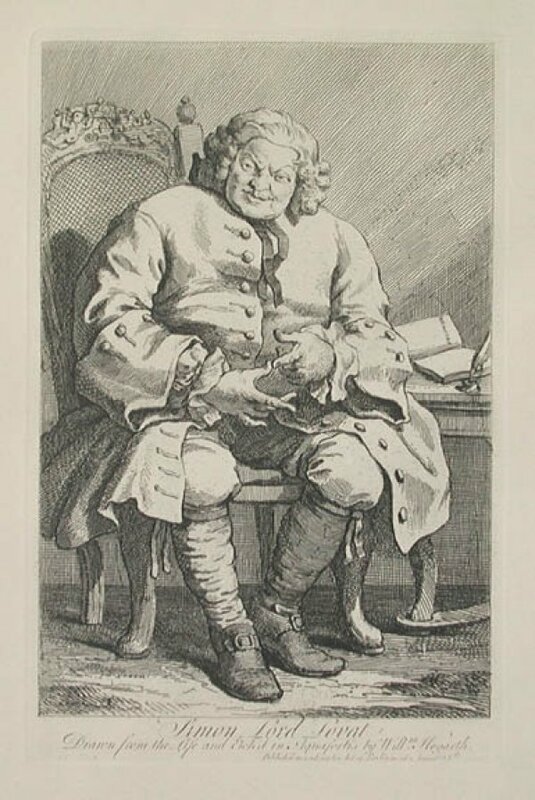 William Hogarth etched Simon Lord Lovat's portrait at an inn in St. Albans on his way to trial and eventual execution. Knowing full well what awaited him, Lovat is busy at work upon his memoirs. Hogarth has created the almost archetypal portrait of a psychopath, his devious face and gestures showing no trace of remorse. It is almost as if Lovat is saying, "For almost eighty years I've thoroughly enjoyed murdering and plundering. Do with me what you will." This is considered a masterpiece of character examination. 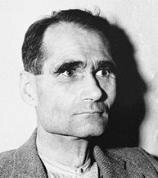 The last prisoner held here was Hitler's confused deputy, Rudolf Hess, whom Churchill called "the maggot in the apple". He landed in Scotland on an improbable peace mission in May 1941, his presence a closely guarded secret by Churchill. A very worried Winston feared that if Stalin had learned of Hess's presence in England, he would with good reason have assumed a deal with the dictator was in the making and perhaps moved quickly to cook up his own deal with the devil and his hordes. Had Hess's presence leaked out, things might have ended much more differently than they eventually did. Nightly for nearly 700 years, the famous Ceremony of the Keys took place at the Tower. The Chief Yeoman Warder, accompanied by some soldiers, set out from the Bloody Tower to lock in succession, the Outer, Middle and Byward Gates. As the party returned to the archway of the Bloody Tower, the sentry cried out, "Halt! Who goes there?" The Chief Warder declared, "The keys." "Whose keys?" "Queen Elizabeth's keys." The sentry allowed them to proceed. The keys were taken to the Resident Governor for safe keeping overnight, the ceremony being completed at 10 p.m. exactly.